The Teen Economists: How might the US Government Boost the Economy? In this controversial age where Democrats and Republicans are at each other’s throats daily, debating the politics and economic problems that face America today, it seems like any simple question will receive a long, complex answer. Unsurprisingly, as the United States enters deeper into a economic stagnation, fueling economic prosperity is on everyone’s minds. But just how simple is the answer? Certainly, there are many different opinions, and there is no “easy” button to press and fix the financial turmoil. However, one tactic could solve a majority of the problems, though it wouldn’t be the popular decision. Reduce government spending. It has been promised by politician after politician, though to them, it usually means cut the estimated growth of spending, not the spending itself. However, with a 17 trillion dollar deficit*, popular is not necessarily the biggest concern. 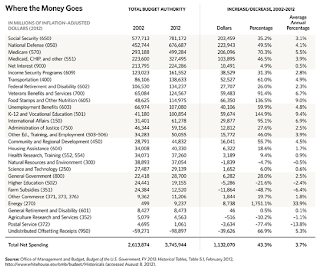 Looking at federal spending in 2012, it is clear that many unnecessary funds could be cut. Social Security, Medicare, and Medicaid take up 44% of spending, according a recent article from The Heritage Foundation, and Obamacare adds another 1.7 trillion. Unemployment benefits, for a country with a current 8% unemployment rate, takes up 5% of the budget. The US Department of Education takes up almost 10%. Taxes aren’t helping an exponential amount--for every $4 the government receives in taxes, it spends $10. 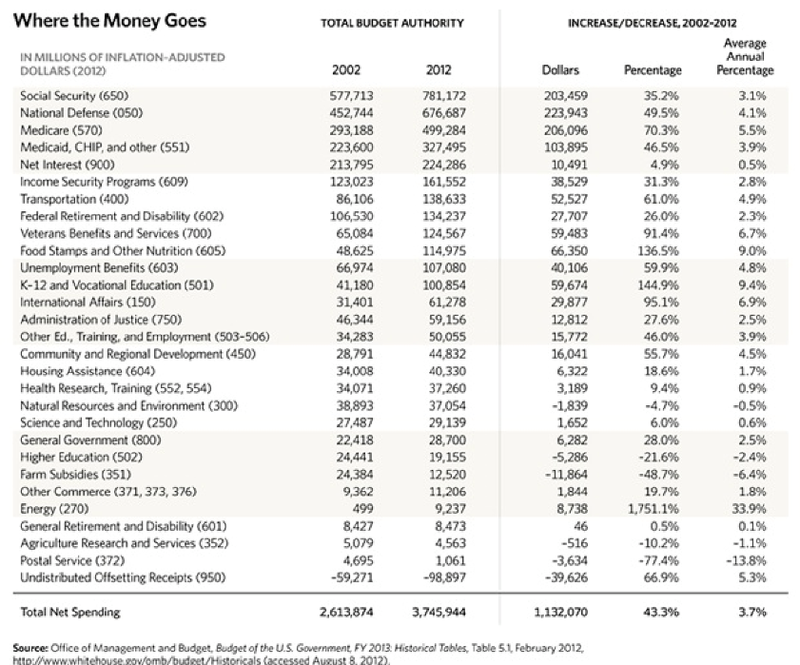 These are only a few of the major statistics, although in the graph below is a complete breakdown for government spending in 2012 and how it compares to that of 2002. Please click on the image to read the data. Unfortunately, many Americans see cutting programs such as Obamacare and the US Department of Education, significantly reducing spending for Social Security, Medicare, and Medicaid, and slashing budgetary allotments for unemployment and welfare as unfair and almost an act of thievery. However, there is proof that this approach works. In the 1990s, Canada had a massive federal debt, almost classifying them as a third world country, with annual spending making up half of GDP. However, they cut spending from 53% to 39% and they experienced an economic boom by the end of the decade. Unemployment fell to 7%, the lowest in almost two decades. Despite critic’s beliefs, the country experienced healthy inflation rather than a devastating recession, and the abrupt reform completely changed the economic stability of the country. In fact, one of the most major programs to be cut for this reform was welfare. While Canada is not currently the most economically stable country, its spending cuts put it on the fast track to success, and it proves a major example for the rest of the world. An even more basic example can be taken from an average American household. Say the family makes $50,000 per year, and then gives 5,000 per year in income taxes. Left with their disposable income, they spend half of that on necessities, such as food, clothes, electricity, and mortgage payments, and the remaining $22,500 can be spent on extraneous causes, such as extra activities for the children, a lavish house, and plenty of luxurious vacations. Contrastingly, they could save that money and put it towards retirement or college funds. Which would allow a stronger foundation for the future? Obviously, having the extra money saved, rather than spending it on necessities. Of course, a government is more complex, but the basic idea of smart spending is a common underlying theme. The problems this may cause are not undeniable. First, Canada and the United States have different systems of Government. Canada was able to quickly implement an intricate change, while different branches of the US government make that less feasible, but not impossible. Statistics from the United States census show that 1.7% of the population is completely dependent on welfare but over 100 million Americans are benefiting from at least one welfare program, making it difficult to cut the programs with significant results right away. Again, this setback is not impossible to overcome, just difficult. Besides, isn’t it in the American spirit to overcome difficult challenges rather than let them overwhelm our nation? To some, this may seem to be oversimplifying the answer, and they are not wrong. However, government spending is the main issue with our current economic state and reversing it is the simplest way to see real change. Looking at Canada’s example or even a generic American household, reduced spending is the best way to produce steady, long-term growth, providing a sturdy economic foundation for the future. Brenna is a 17 year old home schooled girl from the United States. She has recently taken up learning about economics and has found it to be a new favorite subject! In addition, she is fascinated with criminology, psychology, any reading she can get her hands on, and history. In her free time she enjoys acting in local plays, working with children, and volunteering anywhere! This is her fourth published economics article overall, and second for The Teen Economists. In the future, she hopes to work for the FBI as a behavioral science analyst. She hopes you enjoy the article! The government should really consider assessing the budget they allot on projects.